This week’s Then & Now comparison comes from our guest contributor, the esteemed local historian Robin Leach. Robin has written numerous books on the history of Kenilworth, maintains two websites on Victorian Kenilworth and Kenilworth in WWII and will be the guest speaker on the History of the Abbey Fields at October’s KHAS meeting. The 1985 view from the left shows the men’s changing room, entrance, women’s changing and catering kiosk all built in 1965. To the right are the public conveniences built in 1971, and behind is the plant for water heating and filtration, the wooden-clad building dates from 1935 and was originally thatched and built in a style copied from the still surviving 1926 Bowls & Tennis Pavilion. In the 1985 rebuild, the men’s changing and entrance were altered but much of the original brickwork and roof remained; the women’s changing room became the indoor cafe area. Demolition of parts of the old pool as required started in September 1985, and the first swimmers in the new indoor pool were on 6th October 1986, officially opened on 31st October. The 1971 conveniences remain although modernised. The sprung-rocker in the 1985 photo was then quite new, replacing one of those brilliant horse-rockers, and it survived at least until 2008 (or at least one of that type did). The tree dates from the early Edwardian years when there was much tree planting in the park. 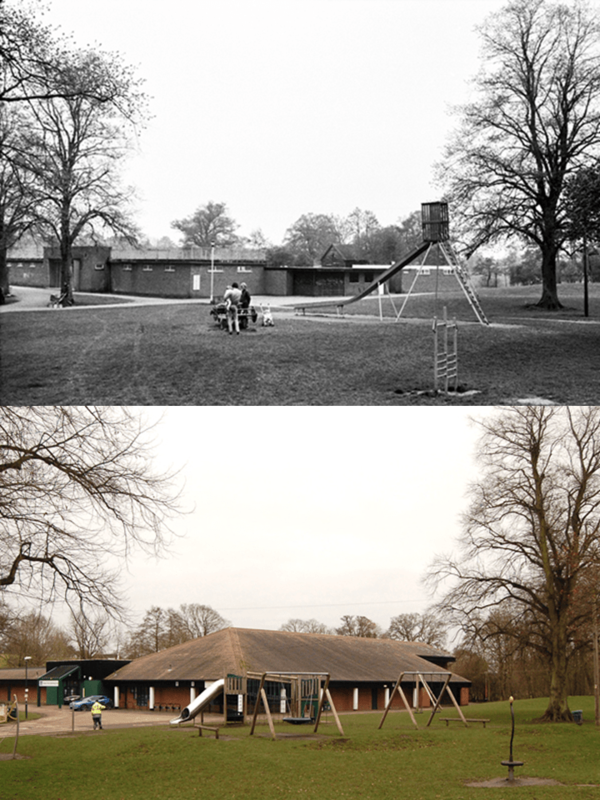 The slide in the 1985 photograph was installed as part of the coronation celebrations in 1953 and lasted about 40 years! The new swings are part of the new extended play area opened on 24th May 2013. This scene has current relevance due to the proposal that the Castle Farm sports hall may move onto the outdoor pool site which is, officially at least, still on the table.